The Nu Horizon is a state of the art stable isotope ratio mass spectrometer designed for flexibility, high performance, and reliability, together with a user friendly instrument control software and data analysis suite. The Perspective IRMS instrument is designed as the ultimate next generation IRMS with the largest mass dispersion by far (60cm for CO2) of any IRMS. 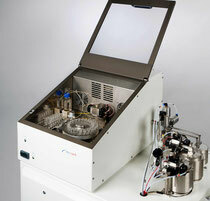 The Nu Instruments nu carb automated carbonate device, interfaced to the Nu Instruments PERSPECTIVE isotope ratio mass spectrometer will precisely determine δ13C and δ18O isotope ratios of small amounts (15-150μg) of calcium carbonate.